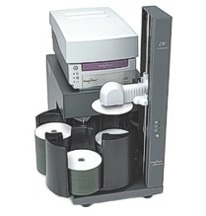 CD Duplication, DVD Duplication, CD Replication UK Services » Blog Archive » Is CD replication better than duplication? Is CD replication better than duplication? With advances in technology, it has become very easy to duplicate or replicate a CD/DVD. If you are a business owner and need to make CDs or DVDs to give to your customers or the clients, then the replication and duplication method will help you. Duplication is a process in which the burning takes place on a blank CD or DVD using automated machines. The artwork or the paper label is printed on the surface of the CD or DVD. It is the same as CD burning or DVD burning. It means that the disc will be pressed from the glass master and the artwork is printed directly on the surface of the CD or DVD. The information is then pressed and embedded on to the disc. It takes more time because the process is longer. If you have the time and you need more than 500 copies, then the process of replication is the best choice. If you want less number of copies, then CD duplication is the best option. The quality of duplication and replication differs. Some people say that the quality of replication is much better, if compared to the quality provided by duplication. There is ongoing debate about the quality of the disc and some even say that the quality is the same. This entry was posted on Thursday, August 27th, 2009 at 5:12 pm	and is filed under CD Duplication Articles, CD Replication Articles.